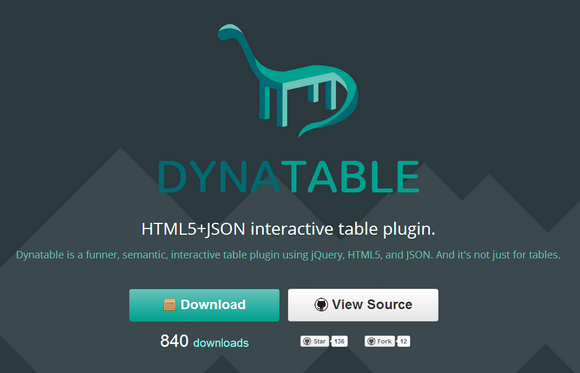 Dynatable is a funner, semantic, interactive table plugin using jQuery, HTML5, and JSON. And it’s not just for tables. The purpose of Dynatable is to provide a simple, extensible API, which makes viewing and interacting with larger datasets easy. Dynatable provides a framework for implementing the most common elements out of the box, including sorting, searching and filtering. Above all, Dynatable is a clean and elegant API that is fun to use. Very nice Table Plugin… congrats! How does it do with large data sets? 10,000 or so rows with 5-6 text columns? It should do pretty well. Someone posted on Reddit that they tried it with 160,000 rows and couldn’t notice any lag. How many words together it can handle?? We have used dynatable and the issue we face is that, it is not semantic. if there is a phrase “a b c”, assume each to be words rather than letters). we expect “a+c”, “a+b”, “b+c” to return the actual phrase “a b c” but it works only if we give “a+b+c”. Fuzzy search or Fuzzy matching .. is it possible to do with this library? Should be doable. By default, Dynatable implements only naive text-matching in an effort to be lightweight out of the box. However, it’s pretty easy to pass through your own search function with fuzzy matching however you’d like.